Dates listed above are for the 1-day getaway. If you are booking a 2-day getaway, you will arrive on Friday and depart on Sunday. and the adventure of a lifetime! 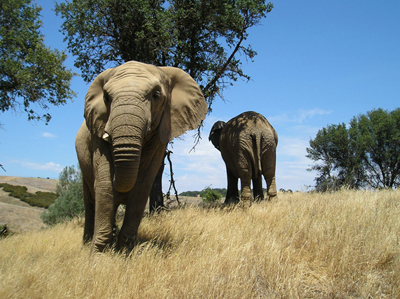 Visit PAWS’ ARK 2000 sanctuary, in the California Gold Rush town of San Andreas, in Calaveras County, where “seeing the elephant” is once again. . . an exotic sight, unequaled experience and the adventure of a lifetime! Captivity: Elephants in captivity have suffered greatly and need specialized care. The unique elephants who share our lives at PAWS are representative of all captive elephants. We hope to provide an experience that will enlighten our visitors to the problems inherent in keeping these highly social animals in captive situations and the understanding and care that is necessary to meet each individual elephant’s special needs. • Arrive in the San Andreas area on Friday. • Spend Friday and Saturday nights in a beautiful bed and breakfast located in one of the historic Gold Rush towns near PAWS’ ARK 2000 sanctuary. Check in any time after 4 p.m. Awake each morning to a lovely, nutritious breakfast. • Check-in for SATURDAY’S ARK 2000 visit begins at 8:45 a.m. at the sanctuary’s front gate. • Meet your hosts, PAWS’ president and co-founder Ed Stewart, and ARK 2000 sanctuary manager, and senior elephant keeper, Brian Busta. • Receive an “insider’s” tour of the elephant habitats and spend an educational, fun-filled day with PAWS’ elephants — Mara, Nicholas, Gypsy, Lulu, Maggie, Toka, Thika and Prince. • A plant-based picnic lunch will be served. Dine outdoors (weather permitting) within view of the elephants. • On your own for dinner on Friday and Saturday. • Check-in for SUNDAY’S ARK 2000 visit begins at 11 a.m. at the sanctuary’s front gate. • Visit the habitat areas of the rescued big cats and bears who have found sanctuary at ARK 2000. Listen, and learn, as Ed Stewart shares their stories. To make your pre-paid reservation for the 1- or 2-day "Seeing the Elephant" Educational Getaway contact Kim Gardner, PAWS' director of programs, at (916) 539-5305 or email kimkleingardner@yahoo.com. Click here to view printable 8.5" x 14" "Seeing the Elephant" Getaway flyer. Q. How often do the “Seeing the Elephant” Getaways take place? A. Approximately once per month – with the exception of hot, dry summer months. Q. What are the times? A. Saturday's Getaway begins at 9 a.m. and ends around 2:30-3 p.m.; Sunday's visit begins at 11 a.m. and ends around 1:30-2 p.m.
A. After you book your trip, you will receive confirmation, directions and other necessary information — about one week prior to your scheduled visit. Q. Is there much walking? A. Yes, a lot of walking. These visits are primarily on foot, on various terrain, up and down hills. However, guests may rest as needed and we do provide transportation if needed. Q. How many people take part? A. The groups are generally limited to around 40 people. A. You will be served a plant-based lunch and dine outdoors (weather permitting) within view of the elephants. Q. Can I touch the elephants? A. No. For safety purposes, there is no touching and all guests must stay a safe distance back. Q. Can I take pictures or video? A. Please bring your cameras, binoculars, video. No drones allowed! Q. What else should I bring? A. Sun block, hat, umbrellas, water, comfortable walking shoes and weather appropriate clothing. Visits are rain or shine! Q. Can I bring my young child? A. This experience is not suitable for those under 15 years of age. Q. When can I bring my child to see the elephants? A. We generally have two or three public open houses during the year that are open to all ages. See our calendar of events for specific dates, times and ticket prices. Q. Is there anything else I should remember? A. Yes. Please remember there is no smoking allowed anywhere on any PAWS property. And please leave your pets at home. We do not allow any pets on PAWS property, and that includes in our parking lots! A. Yes. Pre-paid reservations are required and can be made by calling (916) 539-5305 or emailing kimkleingardner@yahoo.com. * "They Saw the Elephant: Women in the California Gold Rush," by JoAnn Levy.